What would you do if the day when you'll meet your top idols comes? What would you do to catch their attention and stand out among hundreds of ELF? What would you do just to be in the first row in the crowd? What would you do if you suddenly find yourself face to face with the 10 most dazzling people in the world? What would you do if you accidentally punched your top Super Junior bias in the face in front of all ELFs? "This is it ..this is it.. I'm finally going to see them in person!!" I placed my hands on my chest and took one deep breath to control my excitement. I could almost hear my heart drumming as I stand in the middle of a crowd dressed in blue. I clenched my fist -- crumpling my before neat uniform. When I realized this I quickly lessened my grip and ironed my polo shirt with my palms. Aiisshh.. why am I so nervous? It's not as If they're going to talk to me or anything. I looked around the huge airport to distract myself and hopefully to lessen my anxiety. A girl to my right seemed as nervous as I am. She kept on playing with her lightstick that was attched to a string wrapped around her neck. A group of girls to my front seemed like they've been doing this for a long time since they're just giggling and chatting to pass the time. A girl in her teens walked hand in hand with her little brother. They're both wearing the same personalized shirt. Aww, how I wished my brother has the same fandom as I do. The whole place was close into becoming a sea because of the same colored shirt everyone was wearing...and here I am, dressed in my school uniform. My brown blazer made me look like a total trash in this pretty ocean. Aishh.. really Lee Min Young... couldn't you at least made yourself more presentable before coming here?? I gave myself a faceslap. It stinged but I deserved it. I could've brought an extra shirt but noooooo. Instead, I want everyone in this place to know that I'm the girl who skipped school. I looked down the white tiled floor -- feeling embarrassed even though I know that nobody's paying attention to me. I gave out a big sigh as I placed my hand in my pocket and took out a small plastic. Inside is a cellphone charm. It's a black cat with fake crystal eyes and fake red crystal nose. below it's body is another plastic gem. You can tell how cheap this is but it's all I can buy from my super little allowance TT.TT My cellphone has the exact same cp charm. I know it's tacky but I can't help but spazz knowing that me and my idol would have the same cp charm. I was still in the middle of daydreaming when suddenly I was deafened by the shrieks and screams of hundreds of fans as they ran towards the entrance of the terminal. I quickly put my gift back in my pocket and was about to declare war with the crowd in front of me but sudenly I was rooted to my place. my chest started to hurt as If my heart wanted to break my ribs. Their dazzling smiles made the girls around them swoon. Is it just me or are they....sparkling?? Like Edward Cullen in Twilight. Wow, these kind of people do exist!! I can't believe it.. This is not a dream is it?? Just a few feet away from me walked the princes of my life....Super Junior. I stood there with my jaws dropped not losing sight of the 10 boys.I really wish I could get to see the 13 of them together again. Hankyung, Kangin and Kibum are the only ones missing. Even from afar I could see Leeteuk's famous dimple as he waved to his fans. Yesung wore a geen bonnet and shades and walked confidently, giving occasional smiles to the girls who called out his name. Shindong bowed to a fan and brushed his brown curly hair as he gave a rather shy smile as if the fan he talked to was complementing it. Sungmin wore a pink hoodie and gave irresistable smiles of pure cuteness. wore a white cap and black jacket. Siwon walked in the middle of the group, wearing a salmon colored sweater. I swear you could almost see his abs through that sweater. headphones resting around his neck. Kyuhyun is the maknae for he really looked manly in his black collared shirt and yellow necktie. A gift!! Oh my gosh, I was too busy drooling over them that I forgot what I was supposed to do! This may be the only chance I could be this close to them. Might as well make myself closer. I tried to push my way through the crowd but found it useless. They're as die hard ELF as I am that there's no way they're going to let someone take their spot in the crowd. I tried pushing my way in again but that just pissed a girl and pushed me back. I almost fell on my bottom as she did and my gift fell out of my pocket. I kneeled to pick it up and looked at the hundreds of feet in front of me. Then a crazy idea hit me. Soon I found myself crawling thorugh the crowd. It was damn suffocating in there and sometimes I even get stepped on.
" For Super Junior...For Super Junior... For Super Junior.." I kept telling myself. I kept crawling and within moments I hit my head hard on something metal. I held my forehead in pain and looked to see what it was. I then saw the barricade in front of me.. I was finally in front! I held onto it and helped my way up. When I made my way up I raised my fists in the air in success and held my head high with a wide smile on my face. Like what a boxer does when winning. Suddenly the whole crowd gasped. I opened my eyes and looked around . All eyes were on me. I even saw one glaring at me. Did I say something wrong? Why is the crowd dead silent? My heart almost jumped when I saw the SJ members right in front of me. But... someone is missing.. I realized the voice came from below and was surprised to see him there siting on the floor-- with one hand on his cheeks. He seemed to be in pain. "Are you insane?! how could you do that?!!" growled a girl beside me. Suddenly It became clear. Suddenly I understood what had just happened.
" I...I....I.." I felt a lump in my throat. I can't get the words out of my mouth. Is this for real?!! This can't be happening..
Donghae kneeled to check on Heechul. "Y-yes.. I guess.. Did it bruise?" Heechul removed his hand to reveal his cheek. "Ya, you're fine . Let's go we don't want to be late." Leeteuk patted Heechul's head. I can sense in his tone that he was trying to hold his laughter which was very professional of him since several SJ members started snickering in the back. Donghae held Heechul's arm and helped him to his feet. He fixed his hair for a bit and gave a smile and a small wave to everyone to indicate that he was okay. Everyone cheered when he did. Then, all of them continued walking to the van outside that waiting for them..
" Oppa I'm so SORRY!!!!!" I finally bursted out. I clasped my hands together and closed my eyes hardly hoping he would forgive me. This is certainly one of the top rules in ELFhood. NEVER HURT SJ IN ANY WAY... and I just did..I literally hurt one of them! And of all the members, why on earth did my fist land on Milky Skin Kim Heechul's precious face? Everyone would kill me for this.... not if I kill myself first.
" I'm really really really really sorry!!" tears are starting to form in my eyes now. I opened them to see what he would do but to my dismay he didn't even glance back and just continued walking away. I knew it.. he's mad..really mad.. I just stared at him as the members walked away. Maybe he didn't hear me.. No Min Young he did that on purpose.. He doesn't want to see your face ever again! But it was an accident! I didn't mean to. Maybe he'll forgive me.. Idiot! do you really think he'll forgive you after what you've done?! My thoughts are now battling each other making my head ache. I was in deep thought when suddenly the girl beside me gave me a push.
" Ya, What the hell was that?!! What were you thinkng !??" She seemed really angry.
" You call yourself an ELF?! you should be ashamed!" growled another girl.
" Why did you hit him?! Why our dear Heechul?!!" yelled another. Soon a bunch of fangirls faced me and were either yelling, cursing or just glaring at me. I couldn't speak.I couldn't defend myself. I guess I just have to suffer the consequences. I just stood there with my head bowed low. I felt like a kindergarten being bullied by a bunch of kids from middle school. Suddenly a girl pulled my hair and I winced in pain but I still didn't fight back. I know I did a horrible thing but do I really deserve this? I let them do what they want. They kept tugging my shirt,my hair, my skirt.. anything they could grab. I just closed my eyes and waited for it to end. I placed my hands over my face . I've never been this scared in my life..Fangirls are indeed good friends but also the toughest and meanest enemies you can face. All of a sudden I felt their hands releasing my hair and uniform. I slowly opened my eyes to see the girls still in front of me. However, their before monstrous faces are now gone. Instead, they just stood there...jaws dropped and eyes glimmering as if they just saw an angel. I slowly turned my head to see the person behind me and almost fell on my knees when I caught a first glimpse of him. He gave me a sweet smile. I've seen that smile a thousand times on tv but I realized that it was more mesmerizing in person. I knew Sungmin as the cutest, most innocent looking SJ member but at this moment, the way he stood tall behind me..the way way he placed his hands on my shoulder.. I felt like a princess being protected by his prince charming..
Sungmin looked at the fangirls in front of me and spoke. "Ne, could you let this poor girl go? She doesn't deserve this you know." there's a small smile in his face but from his tone I knew he was dead serious. "But oppa.... Sh-she hit your hyung!" said the fangirl who pulled my hair. She spoke gently now as if the beast I saw in her never existed. He gave her another sweet smile which made her squeal. "Don't worry.. Heechul hyung is okay.. so let's let it all go and give this girl a break okay? Besides, she's sorry" he looked at me once again "right?" I could only nod as my face turned red when his eyes met mine.. Is this for real?? Sungmin oppa is protecting me..
"Oppa, why do you protect that girl? Is she special or something?" said one ELF with a slight jealousy in her tone. the whole crowd, including me, gasped. I'm special? Sungmin just said I am special to him!
" Of course she is special" said Sungmin " All ELFs are special to me." That disappointed me a bit. aigooo, I thought I was really special to him. I'm so stupid for expecting.
" If I saw this being done to you guys, I would protect you too.. That's our job right? Protect the ELF while you protect us." Sungmin is really good at this. All nodded in agreement to every word he's saying.
" So let's all forgive her okay?" there was silence in the crowd . I'm afraid they won't let this thing go. Pleasepleaseplease let them forgive me! That was enough. Everyone went wild after that.
" Anything for you oppa!!" " Yeeeeeesss my beloved Sungmin!! <3"
" For you we'll forgive heeeer!" " We'll let it go for you!!" " yaaay!" Sungmin clapped his hands and gave a wide smile. This made all ELFs squeal and scream more. I almost gave in too. If I had I would be screaming I'll forgive her oppa! too. I placed my hand over my mouth to keep myself from screaming my heart out.
" Ya , Sungmin! C'mon we'll be late for the press conference!" said Eunhyuk as he signaled for him. The members are now going inside the black van one by one.
" Be careful next time okay?" Sungmin gave me a final pat on the head and jogged to the van and climbed inside. Soon enough they were gone. I can't believe all of that just happened. 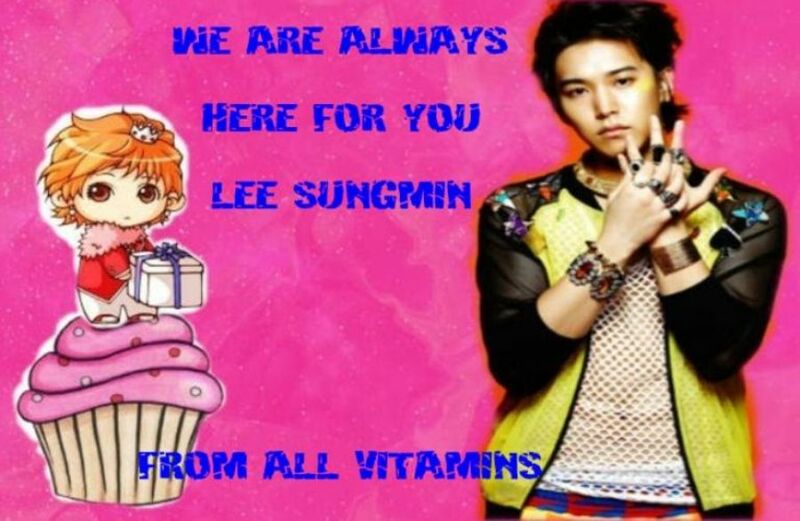 I can't help but feel happy not because I got skinship from Sungmin but because he actually protected me. He was my knight in shining armor. If not for him, I don't know what'll happen to me. The others seem to have calmed down and I took that as an advantage and hurriedly made my way out of the crowd . I can't take this atmosphere. I can't take the glares now that they are back. How is Heechul doing right now?